Great Britain will face Belgium in a 2015 Davis Cup final that few predicted at the start of the DC campaign, and at the same time in the World Group Playoffs, teams defending their World Group spot went 7-1, as just Team Poland will be new to the Davis Cup World Group compared to last season. The Scottish Murray brothers brought glory to the Union Jack in Glasgow, as they did it all in a 3-1 win over Australia. Dan Evans lost both his singles rubbers to Bernard Tomic and Thanasi Kokkinakis, but Murray beat both Kokkinakis on Friday and Tomic on Sunday without dropping a set to clinch the tie. The key result came on Saturday as Andy and his brother Jamie fought off Sam Groth/Lleyton Hewitt in a thrilling five set duel to win the doubles rubber. Australia has a bright future ahead in Davis Cup, but Lleyton Hewitt comes up just short of the final in his final season as a DC ironman player. Murray’s dedication to Davis Cup this season has put Team GB just three matches away from their first Davis Cup trophy since 1936. Belgium lacks the star power of some of the other teams in the Davis Cup, but their team unity and chemistry helped put the small European nation into the DC final as well. 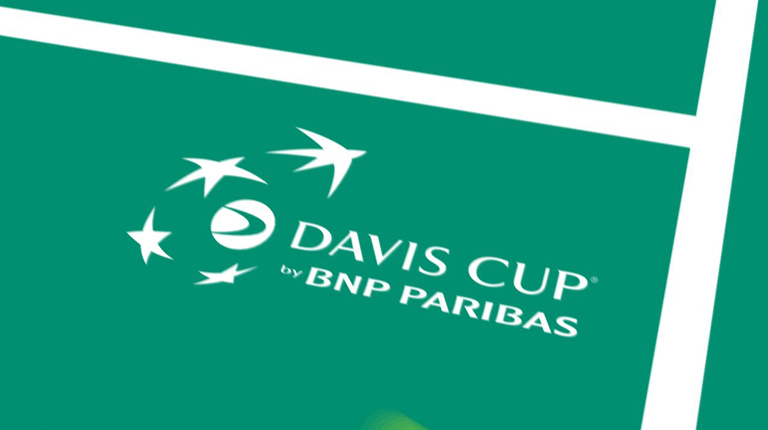 David Goffin won twice in straights over Federico Delbonis and Diego Schwartzman, and Steve Darcis, a journeyman veteran, proved to be the hero as he won a live fifth rubber over Delbonis in a 4th set tiebreak to secure the Belgians the right to host the 2015 Davis Cup final. Argentina didn’t have their best players, but Leonardo Mayer beat Darcis on Friday, and Mayer/Carlos Berlocq combined to win the doubles rubber over Ruben Bemelmans/Darcis to put them up 2-1 going into Sunday play, but they couldn’t finish the job and saw their lead quickly evaporate. Belgium has never been this excited about tennis before, and the best may be yet to come thanks to the successful Goffin/Darcis duo. Somdev Devvarman upset Jiri Vesely after Yuki Bhambri fell to Lukas Rosol, both straight sets results in what was a good Friday showing for India, but they couldn’t keep the momentum going as Rohan Bopanna/Leander Paes were upset in straight sets in doubles by Adam Pavlasek/Radek Stepanek to give the Czechs an advantage on the road. Vesely recovered from his Friday defeat well and sent Bhambri packing in straights to keep the Czechs in the World Group in what was a solid team effort. Indian tennis is improving, but this loss shows they still have a way to go. The Federer/Wawrinka combo was simply too much for an underdog Dutch team to overcome as Wawrinka beat a spirited Thiemo De Bakker in five sets onFriday, and Federer swept up Jesse Huta Galung and De Bakker on Friday and Sunday to clinch the tie without dropping a set. The Dutch did show signs of life on Saturday as De Bakker and Matwe Middelkoop beat Federer/Marco Chiudinelli in a five setter, but the Dtuch never really had a chance in this one. Henri Laaksonen won the dead rubber over Tim Van Rijthoven. Russia won the opening rubber as Teymuraz Gabashvili swept past Simone Bolelli, but in the end having home advantage did little to help them defeat a unified Italian team. Fabio Fognini helped the Italians bounce back with a routine win over Russian young gun Andrey Rublev, and then Bolelli/Fognini won the key doubles point over Evgeny Donskoy/Konstantin Kravchuk in four sets. Fognini would clinch the tie over Gabashvili in straights, continuing his good form, and Paolo Lorenzi won the dead rubber over Kravchuk in 2 sets. Next year, Italy could be a dangerous team if Fognini can perform well. The USA survived what could have been a very tricky tie in Uzbekistan thanks to Jack Sock. Sock won twice over Farrukh Dustov and Denis Istomin, dropping just the set to Istomin, and that result clinched the tie. On Friday, Istomin won a five setter over Steve Johnson, but Johnson, a former NCAA player used to team tennis, bounced back well to win the doubles tie on Saturday with Sam Querrey over Dustov/Istomin in straights, giving the USA a strong advantage. Using some new players in Sock and Johnson, gave embattled captain Jim Courier a much needed win. In the most competitive of the playoff ties, a pair of straight set wins for Kei Nishikori over Alejandro Falla and Santiago Giraldo put Japan into a live fifth rubber, and the young Taro Daniel proved the hero, as he was fearless in his three set victory over Falla. The Colombians were 2-1 up going into Sunday, as Giraldo had beaten Daniel in five sets, and Juan Sebastian Cabal/Robert Farah beat Yoshi Nishioka/Yasutaka Uchiyama in four sets in the doubles, but Daniel bounced back well and kept Japan in the World Group in what was a wise call up for their team. As expected, Victor Estrella’s form was not near good enough to defeat a better quality German team. Estrella did get an opening rubber win over Dustin Brown in four sets, but he lost the doubles rubber with Jose Hernandez-Fernandez to Philipp Kohlschreiber/Philipp Petzschner in straights, and then lost to Kohlschreiber in straights on Sunday to resolve the tie. Kohlschreiber also beat Hernandez-Fernandez on Friday, and Benjamin Becker won the dead rubber over Roberto Cid in 2 sets. Borna Coric stepped up big this weekend for a Croatia team that lacked two of its best players. On the road in Brazil, Coric beat Joao Souza and Thomaz Bellucci to clinch the tie, as Bellucci came up injured in the fourth set on Sunday. Credit also goes to Ivan Dodig/Franko Skugor who shocked Marcelo Melo/Bruno Soares by winning a pair of tiebreaks in the 3rd and fourth sets to win the doubles rubber. Bellucci did beat Mate Delic on Friday in 4 sets, but his physical condition ended up dooming the Brazilians. As expected, Poland and Slovakia went to a live fifth rubber, and the clutch play of veteran Michal Przysiezny won them the day. Przysiezny had lost on Friday to Martin Klizan in straights, but he won in straights over Norbert Gombos on Sunday and erased those demons to send his nation into the World Group. Klizan rolled past Jerzy Janowicz in straights on Sunda, after Janowicz had beaten Gombos, and Lukasz Kubot/Marcin Matkowski had won the doubles rubber over Andrej Martin/Igor Zelenay, but the Slovakians could not complete their comeback. Chile moved into Americas Group 1 with a 5-0 thumping of Venezuela, Pakistan beat Taiwan 3-2 to join Asia/Oceania Group 1, Rafael Nadal and Spain remained in group 1 with a dominant win over Denmark, and Portugal, which features Joao Sousa and Gastao Elias, and Hungary will join Europe/Africa Group 1 with wins over Bulgaria and Belarus respectively, both by a score of 3-2. Posted in: Aegon GB Pro Series, ATP Challenger, Glasgow, ITF, Niall Clarke, On Site. Tagged: 2015 ATP Challenger, 2015 Glasgow Challenger, 2015 Glasgow ITF, 2015 ITF, 2015 ITF women's, Adam Pavlasek, Aegon GB Pro Series, Aegon LTA, Aegon Pro Series, Alexander Nedovyesov, Andrej Martin, atp challenger, atp challenger tour, Brit LTA, British LTA, Chloe Paquet, Conny Perrin, Dan Cox, Daniel Cox, David Guez, Edward Corrie, GB Pro Series, GB Tennis, Glasgow, Glasgow Challenger, Glasgow ITF, Glasgow Tennis, Isabelle Wallace, itf, ITF Women's, Kristyna Pliskova, LTA, LTA Tennis, Maryna Zanevska, Matteo Viola, Matwe Middlekoop, Michal Przysiezny, Naomi Broady, Peter Torebko, Ruben Bemelmans, Scotland, Scotland Tennis, Scottish Tennis, Scottish Tennis Championships, Tara Moore, Tennis Scotland, Ysaline Bonaventure. Another cold day in Glasgow meant another day of tennis for me to enjoy. Despite the freezing temperature outside, there was a lot of hot action in the Scotstoun leisure centre today. Firstly I went to court 4 to see our own Conny Perrin take on the number five seed Ysaline Bonaventure. It was a fairly hot tempered affair, which contrasted nicely to the weather. Bonaventure’s lefty serve and flat groundstrokes were enough to see her take the lead in the opening set, but at 5-3 the Belgian failed to serve it out. Perrin tried to use her variety to wrestle control from her opponent, but soon enough the Swiss found herself a set down. Bonaventure continued that momentum in the second set securing an early break whilst her coach cheered her on next to me. Both players were very much amped up during the match. Both players threw their rackets to the floor in frustration, and had words with the umpire about questionable line calls. Bonaventure however managed to keep her cool enough to serve out the match. 6-3,6-4 being the final result to the Belgian who was a bit too powerful for Perrin. Speaking after the match Perrin told me that it was a ‘difficult’ match and that Bonaventure adapted well to everything she tried. Conny also told me that the courts are playing very slow, so it was difficult to hit through her opponent. Next up was the number one seed in the mens singles Alexsandr Nedovyesov vs Peter Torebko of Germany. The Kazakh’s possessed the bigger weapons, but he was also wildly inconsistent. The German had his own struggles on serve, with his percentage being 35 for the whole match. There were plenty of breaks in this one, as both players struggled to really get a grip on serve, the most significant example coming at the end of the first set. Nedovyesov served for the set but couldn’t convert, and then in a reverse of fortunes Torebko had his chance to serve for it at 6-5, but the German also failed to close out the set. Therefore we were treated to a tiebreaker, which was largely dominated by the Kazakh, who’s forehand and ability at the net proved too much for his opponent. Tempers flared during the match with both men getting visually frustrated because they couldn’t hold on to serve and build an advantage. 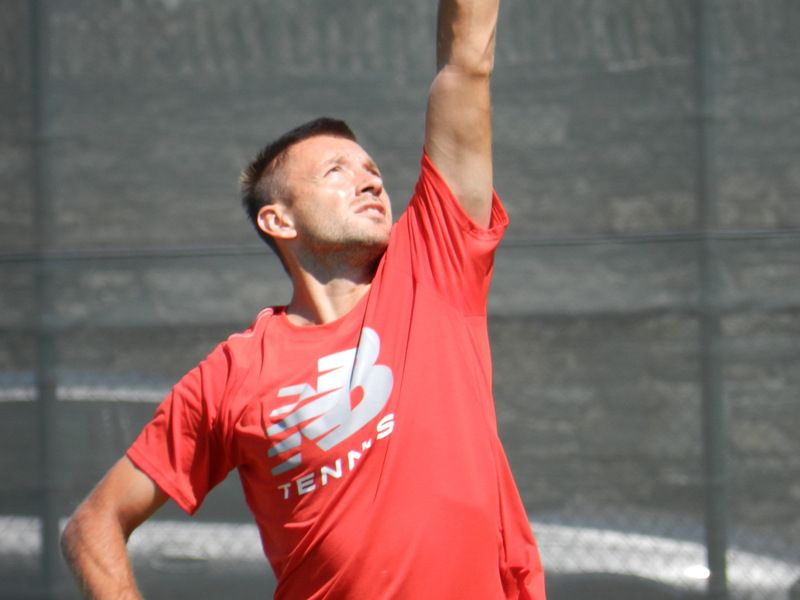 In the end Nedovyesov gained the upper-hand and earned the chance to serve for the match. In what became the familiar theme in this match, the top seed struggled closing it out, but In the end he got the job done to take the match 7-6,6-4. It was back to the women’s for my second viewing of young Brit Isabelle Wallace. The 17 year old however fell easily to fellow qualifier Chloe Paquet 6-1,6-1. A big lesson for the young Brit. I stuck around to see an all British clash as third seed Naomi Broady faced Tara Moore in the women’s singles. The big serving Broady raced into a 5-1 lead in the opening set, and was looking like she was going to run away with the match. Moore had other plans however, and she battled back to get the score to 5-3 before eventually losing the set. The second went pretty much the same, with Broady’s aggressiveness getting the better of her more defensive opponent. The third seed raced into a 5-2 lead and a chance to serve out the match. What proceeded was by far the longest game of the match as match points and break points came and went like the sun in Britain. Broady remained strong enough to seal the match 6-3,6-2, but it wasn’t as easy as the scoreline suggests. 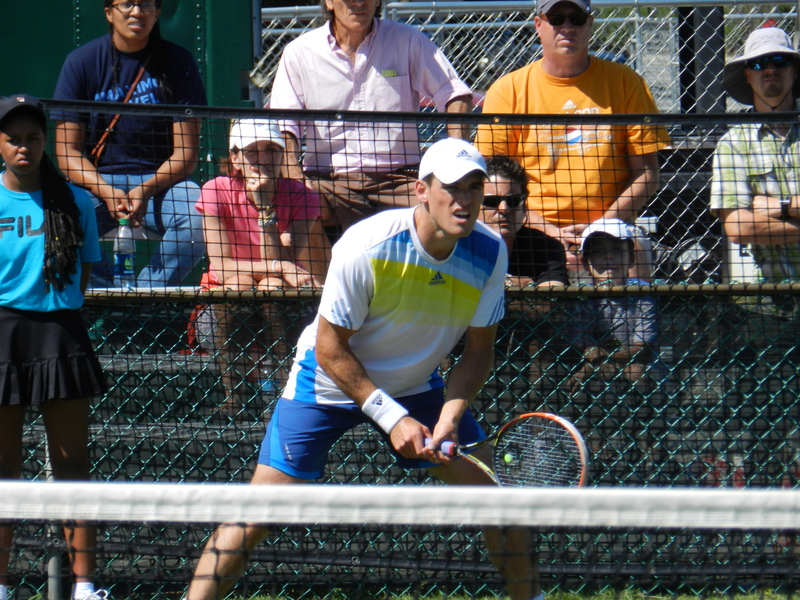 The final men’s singles match on court six was an interesting match between Adam Pavlasek and Ruben Bemelmans. Pavlasek competed in the Hopman cup for the Czech Republic, and Bemelmans competed in the Australian Open, losing to Ivo Karlovic in the first round. The Czech was under pressure in his first service game, but he pulled through and broke his Belgian opponent in the next game. Pavlasek held serve for the rest of the set to secure it 6-3. You got the sense that Bemelmans was working his way into the match more and more as the first set went along, and in the second set he started to turn the match around in his favour. The Belgian took it 6-3 with some impressive shots helping him level the score. Pavlasek however didn’t let losing the lead get to him, because he soon re-established it in the third set; breaking Bemelmans to love at 2-1. The Czech held out to serve for the match, but Bemelmans kept fighting and soon found himself level on the scoreboard. It was only a few games later when the turnaround was complete, as he took the third set 7-5 to complete the closest encounter I have witnessed this week. Whilst Pavlasek and Bemelmans were going at it on court 6, an upset was brewing on court eight. Number two seed, Michal Przysiezny was in the top 100 a year ago, but 12 months on, he has found himself losing in the opening round of a challenger event. France’s David Guez came from behind to defeat the Pole 5-7, 6-4, 6-2 in what looked like a thrilling encounter. Other results in the men’s singles included Britain’s Daniel Cox beating Matwe Middelkoop in straight sets, 6-4,6-1. Axel Michon also finds himself in the second round after Yan Marti retired from a set and two breaks down. There were also wins for Julian Reister, Niels Desein and Jonathan Eysseric. In the women’s, there were victories for top seed Maryna Zanevska and number two seed Kristyna Pliskova. I’ll be back for my final day in Glasgow, hoping for some more great tennis. Posted in: ATP, Newport. Tagged: 2014, atp, Day 1, Donald Young, James mcgee, Michal Przysiezny, Newport, qualifying, saturday, Steve Johnson. One breezy day removed from Tropical Storm Arthur, the favorites breezed into final round qualifying at the Hall of Fame Tennis Championships in Newport, Rhode Island. Top qualifier Ante Pavic needed all of 53 minutes to defeat Frederik Nielsen, 6-3, 6-2. 2 seed Hiroki Moriya needed all of 55 minutes to advance past Divij Sharan 6-2, 6-3. Ruben Bemelmans played what seemed like a marathon, a 108 minute three set win over Gerardo Lopez Villasenor, 6-7(8), 6-3, 6-1. The pair of Americans in qualifying also rushed through the opening rounds. Kevin King dispatched Jan Hernych, 6-4, 6-2, in 1:02, while Austin Krajicek wasted little time with Adrian Bossel, 6-2, 6-1 in just 42 minutes. In the carnival sideshow, 42-year-old wild card Sandor Noszaly hit 12 double faults and gave himself little chance against 23-year-old Takanyi Garanganga. Garanganga won the match 3 and 3. Thus inspired, I will be seeking a wild card to qualifying next year. The shortest match of the day was the double-bageling of Sarvar Ikramov in a 34 minutes. For a complete match. The fans were due for a real match and they finally got one at the end of the day. James McGee came back and broke back in the second set on the verge of a straight sets loss. Snatching defeat, he then won the 2nd set tiebreak and grinded out a win over Michael Venus, 6-4, 6-7(3), 6-2. in 1:51. On practice courts, Michal Przysiezny hit with Marius Copil and Steve Johnson with Donald Young.